DARTMOUTH-James A. Tavares, 69, of Dartmouth, passed away peacefully at home surrounded by loved ones on Tuesday, April 9, 2019. He was the former husband and friend of Suzette L. (Vaudry) Tavares and son of the late Edward and Mary Ann (Galleano) Tavares. Born in Brookline, he resided in New Bedford for many years and in Dartmouth since 1993. Mr. Tavares was the owner of G.T.C. Painting. He was a devoted Born Again Christian and was a member of the former Church Of Christ in New Bedford. 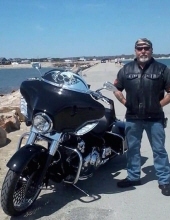 He loved to ride his Harley Davidson motorcycles with his “bros” who were his lifelong friends. He was a member of the Legendary Street Rods Car Club. Mr. Tavares was a Master Black Belt in Krav Maga and trained at America's Best Defense Dojo in Rhode Island. 3 brothers, Bruce Tavares and his wife, Sandy of Dartmouth, the late Steven Tavares and Ricardo Tavares and his wife, Anna of Dartmouth; and several other nieces, nephews, great-nieces, great-nephews and godchildren. A celebration of his life will be conducted at a time to be announced. In lieu of flowers, donations may be made in his memory to St. Jude Children's Research Hospital, 262 Danny Thomas Place, Memphis, TN 38105 or donate online at www.st.jude.org. To send flowers or a remembrance gift to the family of James A. Tavares, please visit our Tribute Store. "Email Address" would like to share the life celebration of James A. Tavares. Click on the "link" to go to share a favorite memory or leave a condolence message for the family.